TUMEKE! : Why is billion dollar private prison being designed as a kill zone? Why is billion dollar private prison being designed as a kill zone? The moral and fiscal failure of our media driven knee jerk lynch mob mentality to punishment has gone to dizzying new heights of hateful stupidity with the billion dollar waste of tax payer money the new private prison at Wiri now represents. How the sleepy hobbits of NZ have allowed the Shire Volk to implement such counter productive spite as prison policy is a lesson to all that the apathy that saw last years election generate the lowest voter turn out in 120 years produces a Government of low decision making qualities. As this blog has tirelessly pointed out, the select committee into the privatization of prisons heard from the head of private prison provider, GEO, that the mixed model would NOT save any money. Allowing a corporation like SERCO, who run the appalling detention camps in Australia and the worst prisons in Britain to gain a foothold here is tantamount to allowing a tumor to grow unmolested by surgery. SERCO have a record of abusing prisoners and the Mt Eden franchise has dumped the cost of Prison Chaplin's and are attempting to dump costs associated with determining a prisoners self harm risk status. That adds up to more suicides which at least helps keeping their recidivism rates low. SERCO care about one thing, and one thing only. Profit. Making profit from incarceration creates an incentive for companies to do as they do in America and dabble in victims rights groups to promote the harder, longer sentencing brigade into manipulating the political and public reaction for more incarceration, which in turn equates to more profit. The Governments line that SERCO will be fined for not reducing recidivism is a productivity red herring. By the time those results come in, SERCO will have gained such a large part of the budget, they will be calling the shots, not the Government. The Government are on the verge of announcing up to 3 prisons to be shut, causing hundreds and hundreds of job losses and will move the bulk of these prisoners into the new 960 bed private prison at Wiri which will give SERCO a much larger percentage of the prison population. Attempting to tell SERCO that their methods aren't working and we want our money back once we've sunk a billion in and closed prisons and paid out redundancies is going to be as pointless as asking the Captain of the Titanic for a refund after colliding with the iceberg. So shouldn't we be asking some questions about this disgusting head long rush into building an empire of suffering out of our prison industry? How about a really, really basic one like why does this look like a poorly designed 'kill zone'? Right next to the future Wiri Prison complex with over a thousand prisoners, is the Wiri fuel storage terminal. In 2005 the Buncefield fuel storage terminal in the UK exploded causing vast damage to everything around it. If there was a fire at the Wiri terminal, how would they evacuate anyone from the prison next door? 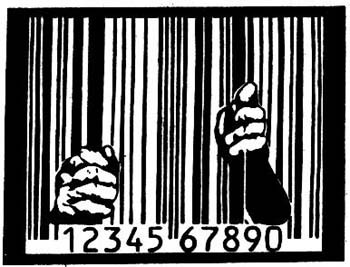 The ramifications of allowing private corporations to run our prison system for profit is an abomination that can warp the incentives away from rehabilitation towards endless incarceration. Bill English's 'moral and fiscal' prison failure has now become bitterly counterproductive as well.